In The Best Dog In The World, Steven helps his mother foster a dog. You may not be able to foster a dog (unless your parents are willing to do it... and remember, it is a big responsibility!) But there are many other ways that kids can help to make a difference for animals. Here are a few I thought of. - Collect supplies (leashes, collars, beds, food, toys, treats, kitty litter, etc) for a pet shelter. One way to do this is to have a party, and ask each guest to bring one thing to donate. Or, see if you can get your classroom or school involved in a project like this! Many shelters have a "wish list" of things they always need, if you want ideas for what to ask people to bring. - Try raising money to donate to a shelter, by having a lemonade stand, selling crafts you make, etc. Get some friends together to make it even more fun! - See if a local animal shelter has a job for you. 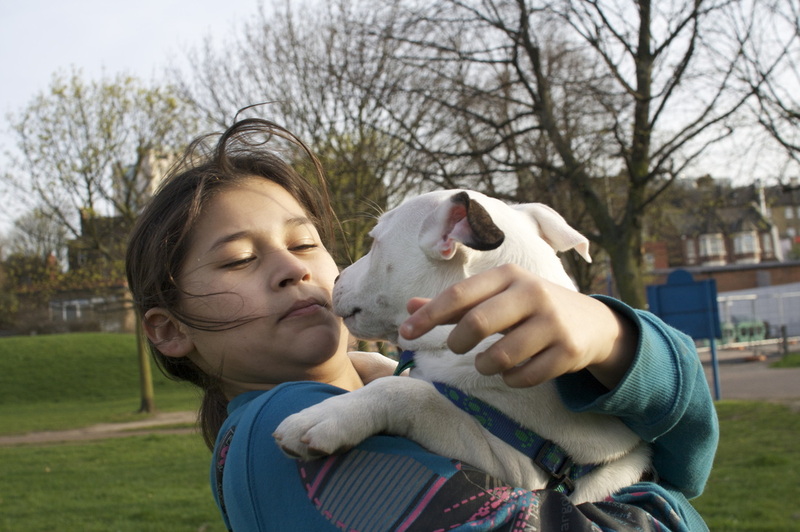 A lot of shelters won't let kids do things like walk dogs, unless their parents go with them. But you might be able to fill water bowls at an adoption show, or help fold fliers for an organization! - Save up all of your household's old newspapers. You can even collect them from your neighbors! Go through the papers and take out all the shiny ads. Bring the regular (non-shiny) papers to a pet shelter! They often use them to line the animals' cages. Old blankets and towels are also great things to collect! - "Tie blankets" are really easy to make. Create a special blanket to comfort a dog in a shelter! - This page has links to some other craft projects that help animals in shelters. - If you have to write a report or give a speech for your class, maybe you could make homeless animals your subject! Help to teach others about ways to help animals. - Be a good role model. If you have younger siblings, friends, cousins, etc, you can show them how to be gentle with pets! Teach them never to squeeze an animal or pull an animal's ears or tail, and never to try to ride on top of an animal. If you have other ideas, feel free to email me and let me know!